Every week we highlight a new game built with Buildbox. Our ‘spotlight’ picks are indie game releases that feature a cool theme or gameplay concept or have performed quite well on the charts. This week’s spotlight is Tepes Ovidiu’s Hyper Fruits. 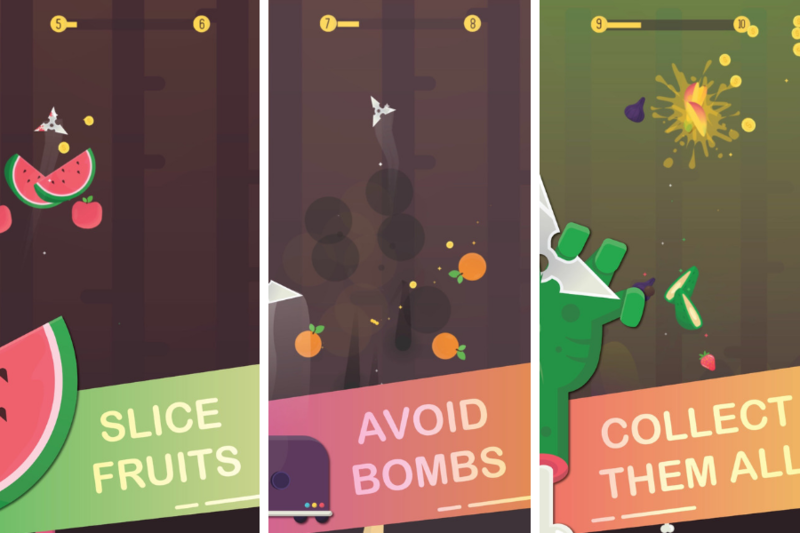 This fun to play action arcade game is an original take on the fruit slicing genre. So, let’s take a closer look at Tepes Ovidiu’s Hyper Fruits and see what makes this slicing game so awesome! Hyper Fruits – Let’s Start Slicing! As an ode to the hit fruit slicing classics like Fruit Ninja, Hyper Fruits takes things up a notch. With bigger rewards, more intense slicing action, and hazardous bombs. In the game, it’s up to players to help a shuriken armed chicken slice falling fruit. This task may seem simple, but it can be quite challenging. Big fruits instantly spawn smaller fruits flying at you in multiple directions and speeds. You have to dodge the incoming fruit while being quick and precise with every aim. Plus, the more you’re able to slice in the least amount of shots the higher your coin reward will be. You can even use shields to become invisible. It’s a lot of fun to play. As the tempo speeds up, the game gets crazy. Apples, melon, coconuts, avocados, pears, strawberries, kiwi, and more will be coming your way. There are also dangerous bombs that must be avoided at all costs. If you let too many fruits fall, hit an explosive, or accidentally get knocked in the noggin, it’s game over! Hyper Fruits also features multiple incentives and IAP’s (in-app purchases) for players. There are daily rewards for playing, coin bundles, IAP to remove ads, bonuses for sharing on social media, and cool unlockable items and characters. Hyper Fruits also includes a cool iMessage Sticker pack. If you’re a fan of the fruit slicing craze and enjoy chicken tossing shurikens, then you’ll love this playing Hyper Fruits! The Hyper Fruits is available for download on iOS. All of our spotlight games are great examples of the cool type of games that you can create using our software. It’s always good to study the success of others. Try to download and play games like Hyper Fruits to help inspire you in your own game making pursuits. Ovidiu is a solo game developer from Transylvania, who made multiple successful games with Buildbox. So, definitely check out his website at Crevasse to see more of his games and get inspired! And if you already have a completed game that you’d like highlighted in our next spotlight, be sure to follow us on social media and our forums. We’re always on the lookout for fresh new games made with BB. To be considered, post on our forum or discord boards in the game showcase sections or hit us up on Twitter. We’re looking for new games to feature, every Wednesday. All you have to do is post a tweet that mentions us @buildboxdotcom and add a link to your game along with the hashtag #BuildboxGameWednesday and your game might be picked for our next spotlight. For more awesome games made with Buildbox, be sure to check out our official Showcase page!